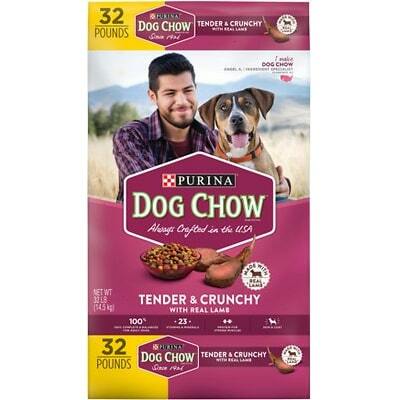 Puppy Chow Complete Chicken Flavor is a low-priced dog food that overall is a lower quality. This product has 11 controversial ingredients, which includes artificial colors and flavors. The food has a high amount of carbs, compared to its protein and fat content with mixed meat and fat quality. 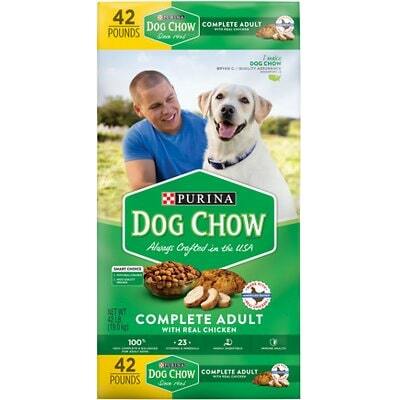 Nestlé Purina, which owns the Puppy Chow brand, has more than the average number of recalls. But on a good note, they were overall pretty transparent when answering our questions. Whole Grain Corn, Corn Gluten Meal, Chicken By-Product Meal, Beef Fat Naturally Preserved With Mixed-Tocopherols, Soybean Meal, Barley, Egg And Chicken Flavor, Ground Rice, Chicken, Mono And Dicalcium Phosphate, Poultry And Pork Digest, Fish Oil, Salt, Calcium Carbonate, Potassium Chloride, L-Lysine Monohydrochloride, Choline Chloride, Minerals [Zinc Sulfate, Ferrous Sulfate, Manganese Sulfate, Copper sulfate, Calcium Iodate, Sodium Selenite], Vitamins [Vitamin E Supplement,Niacin (Vitamin B-3), Vitamin A Supplement, Calcium Pantothenate (Vitamin B-5), Pyridoxine Hydrochloride (Vitamin B-6), Vitamin B-12 Supplement, Thiamine Mononitrate (Vitamin B-1), Vitamin D-3 Supplement, Riboflavin Supplement (Vitamin B-2), Menadione Sodium Bisulfite Complex (Vitamin K), Folic Acid (Vitamin B-9), Biotin (Vitamin B-7)], L-Ascorbyl-2-Polyphosphate (Vitamin C), Yellow 6, Yellow 5, Dl-Methionine, Red 40, Blue 2, Garlic Oil. The average dog food we reviewed has 39 total ingredients, with 1 controversial ingredient. This product has a surprising 11 total controversial ingredients and 3 of them are in the first five ingredients. This is concerning because the first 5 ingredients make up most of the product. Flavors are added to increase the chance your dog will want to eat the food. The generic term artificial flavor is used to represent a large number of possible additives, some which could be harmul. These flavors may include but not list controversial ingredients such as propylene glycol, BHA and more. Puppy Chow Complete Chicken Flavor is made in the United States. The meat quality of this is mixed. Some ingredients are clearly identified, for example we have Chicken By-Product Meal, Beef Fat, Pork Digest and Chicken. But we also see Poultry which doesn’t show you what animal it was made from. That’s intransparent and controversial. Fish Oil is used as an added oil. We’d prefer an oil with a clearly named source (like for example Salmon Oil), which would be more transparent. No controversial artificial preservatives are on this food’s ingredients list, excellent. Are they always bad? In short, no. That’s because preservatives have an important purpose, which is to prevent food from spoiling. However, we consider 11 artificial preservatives controversial because of their potential link to cancer and other serious health conditions. This food has none of them, so that’s great. While this food shines for skipping artificial preservatives, it drops the ball (or chew toy) for artificial colors. We found a whopping four of them - Blue 2, Red 40, Yellow 5 and Yellow 6. All of them are unnecessary because your dog doesn’t care about the color of the food, plus they are potentially unhealthy. Besides added colors, we found another big no-no: Egg And Chicken Flavor. Instead of adding real eggs and chicken, this food cut a corner and uses artificial flavors. As a dog owner you know that your pup will eat anything from hot dogs to grass, so artificial flavors are not needed and a health concern. 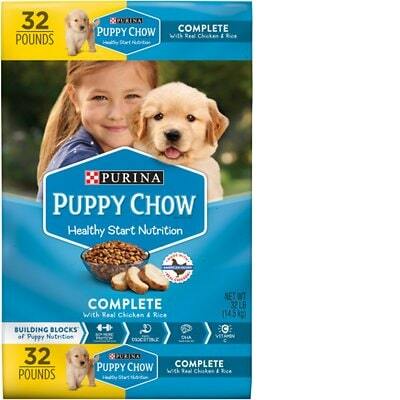 Nestlé Purina, the brand that owns Puppy Chow, has an above average number of recalls. Here are more details on recent recalls. Puppy Chow is owned by the multinational company Nestlé. It required two emails over two weeks to get the answers below. Like most large companies, many of the customer service answers will read like well crafted marketing messages. Since this representative is responding on behalf of a family of brands, they have referenced a few of the other brands that do the feeding trials. Puppy Chow is part of the Purina line, so it appears that they have done the feeding trials. This is confirmed by the AAFCO Statement found on the back of the packaging.